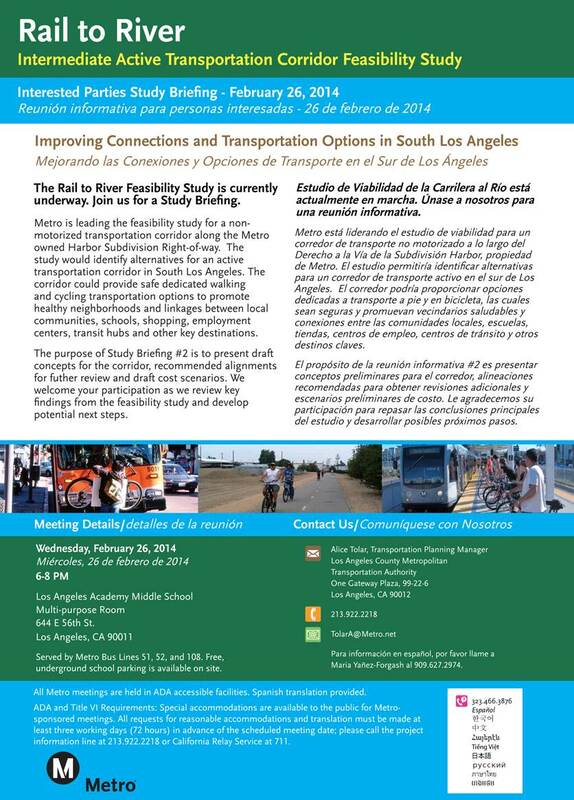 In 2013, Supervisors and Metro Board Members Mark Ridley-Thomas and Gloria Molina began promoting a proposal to build an 8.3-mile pedestrian and bike path that would connect the future Crenshaw/LAX Line to the Los Angeles River. The path would follow the old Harbor Subdivision rail right-of-way that Metro owns and that runs through Vernon and then along Slauson Avenue. It’s certainly a very interesting proposal similar in some respects to other urban rails-to-trails that have been built across the United States. Such a path would serve an area where bikes are commonly used to reach jobs and run errands and the path would connect the existing Blue Line, Silver Line and future Crenhsaw/LAX Line — all important north-south corridors. •Prompted by a motion by Board Members Molina and Ridley-Thomas, Metro last year initiated a feasibility study of building an intermediate “active transportation corridor” along the eastern portion of the Harbor Subdivision. The study is expected to be presented to the Metro Board of Directors this September. The above fact sheet explains the scope of the feasibility study. •Depending on the results of the Study the Metro Board will ultimately decide whether to initiate a project. The Board would also have to decide how such a project would be funded. •Metro purchased the Harbor Subdivision ROW in the early 1990s and does own the land along the tracks. However, as part of the purchase deal, the Burlington Northern Santa Fe railroad owns easements that allow it to run trains along the eastern portion of the Harbor Subdivision. BNSF rarely runs trains on that section of tracks. But Metro would have to deal with those easements in order to make any improvements to the existing transportation corridor, whether it be for an intermediate active transportation use, or to facilitate major transit such as Bus Rapid or Light Rail Transit along the tracks. •Metro owns several old rights-of-way (ROW) in Los Angeles County that could one day be used for rail or busway projects. Metro also has a policy about altering rail right-of-ways that it owns; the policy is posted below. The policy seeks to find a balance between allowing some uses of the ROWs while preserving them for future transportation needs. To help give you a better idea of the lay of the land, here is a video that shows the right-of-way between its intersection with 25th Street running for 8.3 miles to Crenshaw Boulevard and 67th Street. The video was made by Metro using a shoulder mounted boom with camera attached and walking the entire 8.3 miles followed by editing to speed up the footage and give one the feeling of traveling at a higher speed. This line is too valuable as a rail line to be converted into a hiking/biking trail. It runs from Union Station to LAX and on to Long Beach. With slight improvements, it could be used for a new Metrolink line providing express service from Union Station to LAX. At the very least, it should be a light rail transit line. The question, it seems to me, is whether a transit corridor similar to the Orange Line with its parallel bike and pedestrian corridors is feasible for this right-of-way. Connecting to Florence West and Slauson-Blue Line would make a lot of sense, although given Metro’s construction history (e.g., the Red Line stopping short of Burbank Airport, the Green Line not originally being constructed to go into LAX on the west and the Green Line stopping a mile short of the Metrolink/Amtrak tracks on the east) “making sense” and “Metro” are not words I often put in the same sentence. Given how difficult it is to get the Green Line and/or Crenshaw line into LAX the chances of Metrolink are nonexistent, IMHO. Moreover, there already is a very good nonstop service from LAX to Union Station; it’s called LAX Flyaway and it works just fine. There are much better ways to spend transit dollars. I agree with Merritt that this line has a lot of potential. Maybe Metro an build this right-of-way as a double decker structure. The lower deck is a bike/pedestrian path. The upper deck could be either a light rail line. Totally agree with the above. Converting this ROW away from rail would be another disaster in L.A. transportation planning. Metro paid a lot of money for this right-of-way to turn it into a bike path. Unless it can be done as both transit and path, I say rail only. >Inglewood/Crenshaw Line to the Blue Line. Making sure connections to the Silver Line and future Vermont Ave Subway. >Second leg should go from Blue east, slight jog down the UP Randolph branch and head out to Whittier via Bell, Pico Rivera etc. Another true east/west line situated between Green and Expo. The video shows how difficult it would be to use the the ROW for transit purposes without using elevated structures or narrowing the adjacent street. The UP Randolph Line makes a lot more sense than trying to extend the Gold Line down Washington Blvd. to Whittier. Does Metro have any video of some of the other lines it owns ? Were it a trail, much of it looks like it’d be a security nightmare. Look how tightly hemmed in it is on both sides by industrial uses, no “eyes on the street,” no place to make an easy exit in case of danger or threatenting danger, etc. I’d be very relucatant to use it. Are there any plans to study this corridor for a Union Station to LAX line? A double decker structure with the lower deck as a bike/pedestrian path and an upper deck with rail would be amazing if funding could be found. Hopefully a future Measure J equivalent could provide new funding sources for rail expansion. I can’t understand the fascination with Union Station to LAX rail. The current LAX Flyaway system works just fine, it’s already paid for, the price is reasonable, it accommodates luggage, and if lots more people become riders, it can be expanded by adding more buses and trips. Transportation is multi-modal in Southern California; not everything needs to be rail to work efficiently. I’m all for trails and bike paths but to not reserve at least part of this ROW for future rail just seems like a tremendous wasted opportunity. The Slauson segment adds much needed bike and pedestrian lanes on a segment that would likely do poorly for receiving state or federal transportation funding. Metro did a study on reusing the Harbor Subdivision for rail recently – http://www.metro.net/projects/south-bay/reports-harbor-subdivision/ – and it scored poorly. Express Metrolink service, in particular, scored worst in terms of cost effectiveness and environmental justice and was rated poorly in terms of community acceptability. Adding a few more stops (the “regional” alternative) improved things slightly but not to the level where it was considered a high priority. Such regional service would be like the SEPTA Airport Line, which gets very few riders a day, and that for a much more convenient service with stops at each terminal, not transfers to a shuttle bus or people mover. The community wants to see a linear park and a safe active transportation corridor, not a line that will serve passengers from outside their area traveling at high speed through their neighborhoods. I support them in this goal. Metro spending Millions of taxpayer dollars on a rail line and then converting it into a pedestrian and bike path is both fiscally stupid and outrageous. I have driven by this line on Slauson and can recall seeing a train or two on the tracks several years ago. I dare say that those who want to see a pedestrain or bike path there should walk that route today or sometime soon either during the day or especially at night and see how safe it is for pedestrians or bikes. There is much commercial development in that area and if the county was serious about redevelopment and attracting new jobs and housing, this corridor should be at the forefront of that planning. The study CalWatch cites made ridiculous comparisons and false choices between some pretty wierd, Rube Goldberg LRT buildouts and express-only rail services. The studies, like too many Metro studies, were designed to support a political objective: in this case, building the Crenshaw Line on part of the ROW and abandoning the rest. The MetroLink commuter rail system serves over 400 miles throughout the region–and it’s all but unavailable to the SouthBay and Westside. Look at any city in the world (NOT Philadelphia) that’s as vast and sprawling as LA, and they NEVER, NEVER, NEVER try to focus all intercity and commuter rail at one end of the city. Even New York, one of the most centralized cities in the world, has several commuter and intercity rail hubs. Union Station, even with the Purple Line, will always be too far for too many people. We need a Union Station West, and the Harbor Sub is our last opportunity to get heavy rail to the west. Calwatch is fond of quoting railway classifications, but he doesn’t really understand how they’re compiled or what they mean. These tracks can be upgraded for very respectable speeds for penny’s on the dollar compared to LA’s LRT and HRT projects. This video shows what a remarkable asset we have at our disposal. To squander an ROW that can join the entire MetroLink, Amtrak, and potentially HSR networks to the airport, South Bay and San Pedro…to squander all that potential on a paltry few miles of LRT (which could be build adjacent instead) and a linear park behind some abandoned warehouses is LA myopia taken to its complete extreme. Also, CalWatch, any airport train that ran on this would presuppose a spur that goes up the center of the airport U or it would have an external facility at the mainline train station with a people mover connector to the terminals. Do you really not get that? Have you looked at ANY airport rail connections besides Philly and Chicago? Have you looked at Heathrow, Narita, de Gaulle, or a dozen other big city airports? To me “Rail to River” conjures up the proposal to extend the Red Line through the Arts District to the 6th St. Viaduct. No kidding. And you can’t understand the fascination because you don’t understand…it’s not some sick fascination. It’s called transit 101! For crying out loud, this isn’t just some spur hanging in the middle of nowhere. It’s a 30+ mile dedicated ROW that doesn’t just run from UNION STATION TO LAX! It runs from Palmdale to San Pedro. From Burbank to LAX, from Ontario to Redondo, from Glendale to Inglewood…it runs from 70 or so distinct locations to LAX and the South Bay. Eventually, it could even carry trains from the Central Valley to LAX too. Metro’s planning is broken beyond repair. You don’t study one corridor and call it a day. You study the interplay of your system. This line can link LAX and the westside with the entire region by fast, traffic-proof, high capacity rail…all with through, one-seat service. My goodness…we need to start hiring people with international experience at Metro and in City Hall and LA County. I can tell you when people do come here to work from the rest of the world, they quickly get frustrated and leave. You’re going to use buses to move people from Burbank and Palmdale to the SouthBay? From San Bernadino to LAX? Or there all supposed to go to Union Station and trasnfer to a bus and sit in traffic? What about the daily commuters who will use it? With the Harbor Sub, trains from OC and the Riverside line wouldn’t even need to go to Union Station at all…some of them could go directly to the Westside to a new station and to LAX. Union Station wasn’t always there–it was built. We need more mega stations. And we need a mega station on the Westside. But for that, we need a heavy rail east-west rail corridor. To abandon our last east-west rail corridor like this is complete madness. This isn’t New York City where you can focus every heavy rail line on one big station (and even NYC doesn’t manage to do that, with all its centricity). We have GOT to flush out the amateurs at Metro and get some better brains in there. I also find the FlyAway a pretty convenient and reasonably speedy way to get to LAX. That said, the FlyAway is a great solution for now, but 10, 15, or 20 years down the road I’m pretty sure something more will be needed. While I don’t see any likely rail use in this ROW’s *immediate* future, I’m of the mindset that there is a lot of potential to develop rail on this alignment a little further down the line (no pun intended). So, do we leave this ROW completely undeveloped (and an ongoing eyesore) in the meantime? No. Let’s consider beautifying the adjacent neighborhoods (which desperately need it) by building a sort of “pop-up” active transportation corridor, with a bikeway, pedestrian paths, and greenery that would be moderately easy to replace or relocate in the event that a rail use becomes feasible along part or all of the alignment. The more immediate benefit of creating this pop-up active transportation corridor is that it might help spur some needed transit-oriented developments in the vicinity of the existing Slauson Station (Silver Line) and the …er… Slauson Station (Blue Line). Carter W. – the idea of running every Metrolink and HSR train through Union Station along this ROW to the west side seems like a nice idea. But is there a location near the end of this line that could have as many platforms as Union Station? And could the switches at Union Station handle that number of trains coming south from Union Station and all switching onto the same track? There’s 43 arrivals into Union Station between about 6 am and 10 am, so you’ll have a train almost every 5 minutes at some points. That could be great for commute travel between Union Station and the West Side, if the tracks and switches can handle that. The Metro Harbor Subdivision Alternatives Analysis Study proposes future extensions either as LRT, Commuter Rail or Heavy Rail (Electric Multiple Units) on this corridor to connect LA Union Station/Central City to LAX and the South Bay. There is not enough room on this segment to accommodate both a bike path and a rail extension.